Fifty-three new citizens and counting is just one of Gillian Sescoe’s incredible contributions to the Cornerstone’s community. Gillian was a federal employee who spent much of her career immersed in numerous cultures overseas serving her country. Upon retirement, Gillian looked at ways she could use her passion, skills and interests to serve her community in Reston. Cornerstones became one of the conduits of Gillian’s energy and commitment to serve and she has volunteered in many capacities, from representing Cornerstones at donor functions to manning Cornerstones’ booths at fairs and festivals to offering advice to the Development team when they want to come up with new ways to connect people to Cornerstones’ events. However, it is the Citizenship Class that Gillian first developed in 2010 and continues to teach where she has had greatest impact. Herself a naturalized citizen, Gillian is equal parts cheerleader, teacher, confidante, and cultural liaison. Gillian works tirelessly to assist her students in overcoming linguistic, cultural, financial and even transportation barriers so they are able to attend her class. 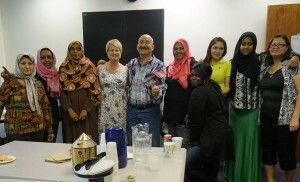 Under her tutelage, participants in Gillian’s Citizenship Class improve their level of English competency while learning the necessary information to successfully complete the naturalization test. The new citizens, representing 15 countries throughout the world, work hard to prepare for the naturalization exam in Gillian’s class. Becoming citizens helps them on their journey toward self-sufficiency, including access to better employment and benefits like health insurance. Through their participation in the class, the students have not only improved their English, they have increased their self-confidence and learned team-building skills as they support one another throughout the citizenship application process. Gillian has often said, “My paycheck is the joy I receive from our clients, knowing I make a difference in their lives.” And Gillian is changing the lives of her students and their families. The majority of her students, for example, are women from cultures where their participation in public life is more restricted than it is here; Gillian has worked with these students to build their self-confidence and encouraged them to more fully embrace their new life here, empowering them to be active participants in their local community. “The citizenship class offered by Gillian Sescoe is one of the most impactful services we offer at Cornerstones. Beyond preparing her students to take the citizenship test, Gillian also mentors and links her students to additional resources to mitigate some of the other challenges they face in their lives. Her students respond well to the coaching and support she provides as evidenced by the 53 students who have passed the citizenship classes over the years. I personally admire her dedication and her unrelenting compassion for her students and feel extremely lucky to have her as a Cornerstones volunteer.” Greg White, Chief Operating Officer, Cornerstones.